Master O'Reilly continues his build-up to running in his fourth consecutive Caulfield and Melbourne Cups in Saturday's Group 1 Underwood Stakes. Trainer Danny O'Brien says drier track conditions will enhance the prospects of perennial Cups hope Master O'Reilly running a much-improved race in Saturday's Underwood Stakes at Caulfield. The veteran stayer kicked off his latest spring campaign with a well-beaten 13th to 2009 Melbourne Cup hero Shocking in the Makybe Diva Stakes (1600m) on unsuitably heavy going at Flemington on September 4. Last year Master O'Reilly ran third to stablemate Vigor and reigning Horse of the Year Typhoon Tracy in the Makybe Diva before a solid effort for seventh to Heart Of Dreams in the Underwood (1800m). The Caulfield track on Tuesday was rated a dead (4) which O'Brien says is much more to the gelding's liking. O'Brien is looking forward to a good showing on Saturday from Master O'Reilly who is set to run in his fourth consecutive Caulfield Cup and Melbourne Cup. The gelding hasn't won since the 2007 Caulfield Cup in which he started favourite, after the short-priced Maldivian was scratched after a widely-publicised accident at the barrier, after which Master O'Reilly finished eighth as $3.80 favourite in the Melbourne Cup. The following year he ran seventh in the Caulfield Cup and fourth in the Melbourne Cup, while last year he was sixth in the Caulfield Cup and fourth in the Melbourne Cup. "The thing about the horse is that he didn't have his first start until he was four," O'Brien said. "He is an eight-year-old but he hasn't had the mileage horses of that age usually have. Like a Fields Of Omagh, he hasn't got the miles on the clock." Fields Of Omagh ran in five consecutive Cox Plates and won his second as a nine-year-old in 2006. "Having said that he's (Master O'Reilly) run in three Caulfield and Melbourne Cups, but he certainly seems as good this spring as other springs," O'Brien said. "If he could run in four consecutive Caulfield and Melbourne Cups, it would be equally as impressive as winning a Caulfield Cup." Master O'Reilly has won eight races and been placed in nine of 41 starts for just shy of $3 million in stake earnings. Dwayne Dunn, who rode Master O'Reilly in the Makybe Diva, has retained the mount on Saturday. Dunn rode Skybeau twice in Melbourne Cups finishing seventh in 1997 and ninth in 2000. 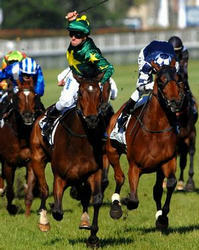 The Len Smith-trained stayer ran in five consecutive Melbourne Cups including his third to Saintly in 1996. Toryboy in 1865 and Catalogue in 1938 and are the only eight-year-olds to win the Melbourne Cup, while Taufan's Melody in 1998 was the last of five horses of that age to win the Caulfield Cup.